Should Christians “Play It Safe” In Life? 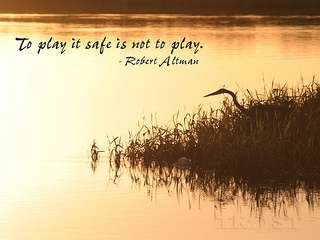 Home › Faith Forum › Should Christians “Play It Safe” In Life? A couple of Sundays ago my wife and I watched the movie Christian Mingle (yes, so named after the dating website), on the UP Network. It was an excellent movie, in case you ever have a chance to see it. But there was a very brief exchange in the movie that got me thinking about a deeper issue – that Christians “play it safe”, perhaps thinking that there’s some form of godliness attached to that behavior. You can watch the actual exchange in the Youtube video at the 1:14:00 mark. That briefest of exchanges got me to thinking about how it may relate to Christians in general – do we sometimes play it safe – maybe too safe? And is that even what we’re really called to do? Why Might Christians Play It Safe? Paul, the male lead in the movie, has apparently centered his life around fulfilling his parents wishes for him. For example, he works in his father’s construction business, and while he’d rather be out getting his hands dirty with the physical side of the business, his father prefers that he stays inside and works on the financial side, such as costing-out jobs. This isn’t actually what Paul wants, but it makes his dad happy, so it’s what he does. Similarly, it’s clear that both his parents would prefer that he settle down with a girl that he has known since childhood – a longtime Christian girl who he has done vacation bible school with. Now he’s known her for years, so obviously there’s some reason why he’s hesitant to actually settle down with her (hence his dating Gwyneth). Yet at some point during the movie he breaks it off with Gwyneth, and does exactly that – or rather, he chooses to do it to satisfy his parents. Still another significant factor in Paul’s life is that his mother (played by Morgan Fairchild) has one of those dominating personalities, the kind that seeks to control anything and everything. She in particular sees Gwyneth as some sort of radical influence that she needs to keep out of her son’s life. And naturally, Paul wants to please his mother too. Now maybe this is an exaggeration, but I think that a lot of Christians fashion a similar lifestyle for themselves. It’s often a life that is based on keeping parents happy, pleasing the boss, coworkers, friends and neighbors. Often, that manifests itself in the form of a reluctance to take chances in life, for fear of upsetting the delicate status quo. Desire to keep others happy is not without biblical foundation either. After all, in regard to our parents there is the Fifth Commandment – Honor thy father and thy mother. And the Apostle Paul does tell us “If it is possible, as far as it depends on you, live at peace with everyone” – Romans 12:18. But there’s a world difference between honoring your parents and living at peace with everyone – and being subservient, as though doing what they say or what you think they want you to do represents some form of godliness. It seems to me that this type of approach – one based on keeping others happy – is doomed to failure sooner or later. Either you will be attempting to succeed in a life that you were not cut out for, or you will experience failure, personal crisis, depression and a host of other nasty outcomes. I’m not in the God-wants-us-to-be-happy crowd – there’s no biblical foundation for that. But at the same time, I don’t think that God wants us to take an oath of misery either. Though there may be times in life when we will need to comply with the wishes and directions of others, that hardly needs to be a lifestyle. Something else that I’ve noticed over the course of my lifetime is that Christians often take on what I refer to as an exaggerated good neighbor policy. Or put another way, blend until you become invisible. We’re so concerned that others will think only good things about us that we can get caught up in trying to please the whole neighborhood or community. But we can lose ourselves in the process. That desire to not offend anyone can even get in the way of our Christian witness. Many of us Christians so associate ourselves with the “establishment” of our time, that I sometimes wonder if we’d miss Jesus even if he were physically right here among us. The early Christians got it however. They understood the radical nature of Jesus and of His message. They were willing to face persecution and even death to spread the Gospel throughout their communities and the world. Many had to leave family, home, and country, to go to distant locations to spread the word. Maybe this is just me, but the desire to be liked by everyone – and to offend no one – isn’t exactly consistent with the inherent radical nature of Jesus and of the Christian faith. Does conformity bring us closer to salvation? I’m not convinced. Now I’m not suggesting that this in any way means that we should become radical in a worldly sense, and certainly not self-centered and narcissistic. But at the same time, we need to understand that there is always a bigger picture, and that each of us has a role to play in it. Exactly what is the role for each of us? Unfortunately, determining exactly what our role in life is usually isn’t easy. Absent a clear direction as to where we need to go – or even who we are – we’ll simply fall into a routine, and often one that’s defined for us by others. As the years pass, we get stuck on the road to routine. We can mistakenly believe that this is God’s plan for us, so we dig in, and do our best to be good neighbors. But once you get into the routine, it’s very easy to forget that you are a unique creation. You may even work hard to suppress certain traits and inclinations, in yet another attempt to fall in line to be a good citizen within your niche. It’s even possible to convince yourself that being different – that letting the real you come out – is somehow even sinful. But I think that God has a specific plan for each of us, one that sometimes upsets the delicate balance we fashion in our lives, and in our relationships with others. Call me crazy, but I take that concept quite literally. And this is when it will do us well to remember that God is big enough to provide for, and to accommodate, the uniqueness of each of us. After all, it was He who made us that way! The Bible tells us that we’re all made in God’s image (Gen. 1:27); I don’t know how you interpret that verse, but to me it means that the possible combinations as to how many talents, traits, goals and desires we each have are as infinite as God Himself. And in Psalm 139:14 we read that we’re fearfully and wonderfully made. That means that we’re not genetic accidents occurring in some random patterns. God made each of us unique because that’s His plan, both for us and for the world. Please reflect carefully on this divine reality in the course of your life. Our directive in life isn’t simply to “be good” – whatever that means. We each have a unique mission. It’s OK to have fire in your gut – to have plans and dreams that you want to accomplish, even if they run counter to the plans and dreams that others have for you. It’s very likely that God Himself put those plans and dreams in your head, and for very specific reasons – even if they aren’t clear to you right now. All of this is a revelation is my own life. Growing up Catholic, I had a concept of Christianity that was largely based on a lifetime of subservience. To the church, my parents, my family, my employers, and to the people around me. Some of that is totally necessary in the Christian walk, as it is critical that we all come to accept that we are each under authority of some sort at each phase of our lives (Eph. 6:5-8, Titus 3:1). But there’s also such a thing as over-compliance. That’s what happens when we work too hard to please other people. Taken to the extreme, trying too hard to please other people is a form of devaluing yourself. The fact is that you DO matter – not just in the sense that you are a human being – but that you are a unique person with very special talents, skills, and abilities to offer others and the world. When we try to bury our uniqueness, we deny ourselves and the world our God-given talents. I’ve struggled mightily in this area myself. Six years ago I made a conscious career choice to become a blogger. The truth is that I was always miscast in a traditional job, especially any that were even remotely corporate. What I realized – many years ago – is that I’m not very compliant. But organizations want just that – compliance. They may talk the talk about creativity, but in the vast majority of companies, true creativity is mostly seen as a threat. Maybe this is a stretch – and maybe it isn’t – but Christians, compliance, and corporate jobs seem to be somehow tethered together in the current world. Mostly I think it’s that the current economic model is based on corporations, and there’s a general level of compliance that is probably higher than at any time in history, at least here in the US. The education system certainly has a lot to do with this. It mostly trains people for employment in government and corporate jobs, and not for self-employment. When you add the Christian predisposition toward over-compliance, the connection actually makes sense. Feel free to disagree, but I see this pattern everywhere. Jumping into an unproven business like blogging seemed somehow unholy on the surface. After all, not one person in a thousand makes any money from it. 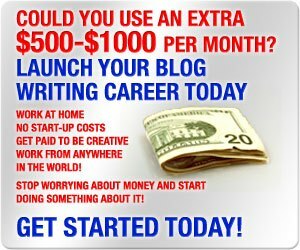 And how many people have answered “blogger” to the what do you do for a living question? It seems more like a hobby than a serious career. Was it a sin to think I could make a career out it? Or perhaps was the real sin my inability to be happily compliant within the organizations I’d previously worked in? The saving grace for me was seeing other Christians blogging, and some like Bob Lotich and Matt Jabs actually turning it into a full-time career. Both seemed to be equally uncomfortable in the conventional corporate world, something I could completely relate to. In fact, in a recent email to my faithful men’s group, I even speculated that the number of Christians blogging and making a living on the web might be a result of the organizational world slowly, but steadily becoming a more hostile environment for Christians. I realized that I couldn’t play it safe anymore, and decided to try my hand at blogging. I’m happy to report that this has worked magnificently for me. Not only am I earning a living blogging, but I’m also able to witness my faith on OutOfYourRut and on other sites that I write for. This is satisfying to me on a personal level in a way that no job I ever held has been. While it’s true that we can and should spread the Gospel from where ever we are in life, it’s also true that we’re usually more effective in doing it when we’re in our “zone”. My family made a decision last year to move from Georgia to New Hampshire. Not only were we moving from a warm, sunbelt “boom” state to an unassuming frost-belt state – and not for any economic reason – but we were also moving from the Bible Belt to the state with the second lowest rate of church attendance in the country. We were also leaving behind many friends, including Christian friends, many of whom we have a family type relationship with. Why would we do that? Because it was on our hearts to make the move. And we’ve learned that when something is heavy on your heart, there’s an excellent chance that God put it there. Call it coincidence, or whatever you like, but since making the move, everything just sort of fell into place. Everything. A few things turned out even better than we expected or planned for. Like my plunge into blogging, this move has put me in my geographic “zone”. My wife feels the same way, not the least of which since the move also brought about a switch to a better job situation for her – something we couldn’t know before making the move. Something else I’ve learned from not playing it safe is that whatever I do, God meets me along the way. I don’t have to have all the answers, but I do have to have faith that God is always with me. In fact, perhaps not having that kind of faith is the biggest sin of all. He promises us in Joshua 1:5 and again in Hebrews 13:5, “Never will I leave you nor forsake you.” In my own life this promise has proven to be literally true again and again, and I have come to rely on it. What about following your hearts desires being a sin? This has been my experience. I’m sharing my story in the hopes that if you play it safe in life – perhaps out of the belief that this is what “good” Christians are supposed to do – that you might give serious, prayerful consideration to following the desires of your heart. It’s not an accident that you have those desires, and it’s probably not a sin either. What ever you choose to do, God is a big enough god to direct you to success, and also to patch your wounds if you make a mistake. My own sense is that as Christians, we should have less fear of the unknown than non-Christians. After all, we’re the very children of Hope, and we’ve been promised that no matter what the twists and turns in our lives are, our Eternal destinies are secure. Is there a better launching pad into following the unknowns of the desires of our hearts? Do you ever find yourself struggling to follow a different course in your life, perhaps because you believe that doing so is somehow outside of the bounds of being a good Christian? Do you ever consider you or someone else following the desires of your heart to even be a sin? I think these are important questions for Christians since we now live in a world where so much of our behavior is orchestrated by outside forces. Feel free to weigh in with your thoughts. 5 Responses to Should Christians “Play It Safe” In Life? Hi Kathy – My wife and I experienced a similar situation with my parents and with her dad when we moved to Georgia in 1993. Of course, none of our parents physically needed us, and there were other children if that were the case. But none of the three approved of our moving so far away. I think their generation expected to have some sort of control over our behavior, even well into adult life. In a way, that made it even more important that we make the move. That’s just my opinion, but please get the opinions of others you trust. Kevin, the challenge for me is figuring out how God speaks to me “personally” as I have learn’t that sometimes I may have my own agenda but he has another. I had asked my daughter how she knew she was suppose to relocate for a job offer. A big and scary move for her as she has never lived in any other place than in Florida where she was born. She said he speaks in dreams. After reading about your relocation I now question whether I was suppose to relocate to be with her and my future grandkids. That is where I am now in the midst of working on trusting him to support me financially in Virginia where it is so much more expensive compared to Florida. At age 57, I want to stay in his will and not do my own thing. I only end up in situations and setbacks that I created for myself even when I knew deep down I was going in the wrong direction. Thanks for sharing you and your family travels. Your forum has certainly supplied me with a place to hang out in and to get inspired. Hi Angela – I’ve always felt that God speaks to me in a variety of ways – through circumstances, through relevant scripture, through people. I think he speaks to us all the time, but we’re too busy to listen. In regard to our move, I’m still trying to figure out if God actually lead us to make this move, or if he is giving us the desires of our hearts (Psalm 37:4) and is making everything work out for us after the fact. Either is possible, but I’ve found consistently that God meets us where ever we’re at. That’s incredibly comforting, as you might imagine. Don’t over-analyze your move. I’m guessing you’re exactly where God wants you to be, despite your own confusion. God can work with our humanity, and even our weaknesses, so don’t worry about that. All he asks is that we step out in faith. By believing that you will be fine you’re demonstrating trust in God for your life and your future. You’ll do fine, and in time you’ll realize why you made the move and it will all make sense. God promises us certainty in eternity – if we believe in his son. But he doesn’t promise us certainty in this life. We have to get used to that, knowing it flies in the face of everything we’re taught in life. Uncertainty = reliance on God. That’s the real place he wants us to be in.